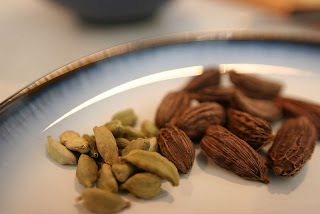 Devoid Of Culture And Indifferent To The Arts: Ingredient of the day: Cardamom, and a Recipe! Cardamom is one of the world’s most ancient spices, being in use since the earliest times of human civilization. It is native to the East originating in southern India, where it still grows wild. 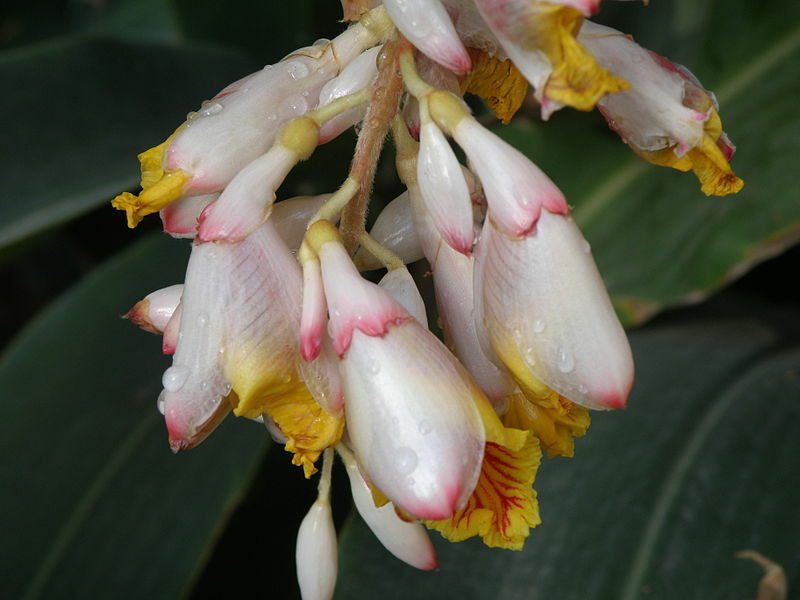 By weight, cardamom is the second most expensive spice, saffron being the first. The ancient Egyptians chewed cardamom seeds to clean their teeth and the Greeks and Romans used it as perfume. Norsemen discovered cardamom more than one thousand years ago in Constantinople and introduced it to Scandinavia. It is still a popular spice in many Nordic recipes to this day and is more commonly used than cinnamon. Cardamom (or Cardamon) refers to several plants of the genera Elettaria and Amomum in the ginger family Zingiberaceae. 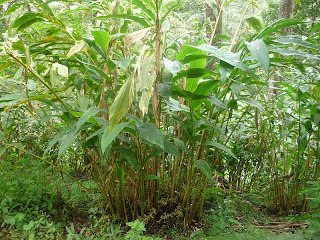 Both genera are native to India and Bhutan, they are recognized by their small seed pod, triangular in cross-section and spindle-shaped, with a thin papery outer shell and small black seeds. Elettaria pods are light green while Amomum pods are larger and dark brown. Both green and black cardamom are used as flavouring in food and drink and in some cultures as a medicine. Cardamom is best stored in its pods, because once ground it begins to lose its aromotic qualities. It only takes a few seconds to grind green cardamom for use. A generally accepted equivalent is 10 pods equals 1-1/2 teaspoons ground. In India, green cardamom is widely used to treat infections in the teeth and gums, to prevent and treat throat problems, congestion of the lungs and tuberculosis, inflammation of eyelids and digestive disorders. It is also reportedly used as an antidote for both snake bites and scorpion stings. Green cardamom has a strong, unique taste with an intensely aromatic fragrance. Black cardamom is more smokey, though not bitter, with an aroma some consider somewhat similar to mint. Because of cardamom's connections with Istanbul (straddling both Europe and Asia) via the spice trade in the middle ages, cuisines in both the East and West have many uses for this spice. A few of my favourites are in homemade curry blends (Indian) and Cardamom cookies (Scandanavia). If you've never made a homemade curry mixture you should try. They're amazing and bursting with flavour. Cardamom has also been used as one of the flavourings in gin, and some people swear that to make good mulled wine you must always use cardamom. It's taste is like nothing else and complements meat dishes as easily as drinks and fruit. The following recipe is a nice, refreshing way to enjoy its singular flavour. Combine 1/2 cup of the pear nectar with the sugar and cardamom in a small saucepan. Bring the mixture to a boil, reduce heat and simmer to dissolve the sugar. Remove from the heat and add in the remaining pear nectar, brandy and lemon juice. 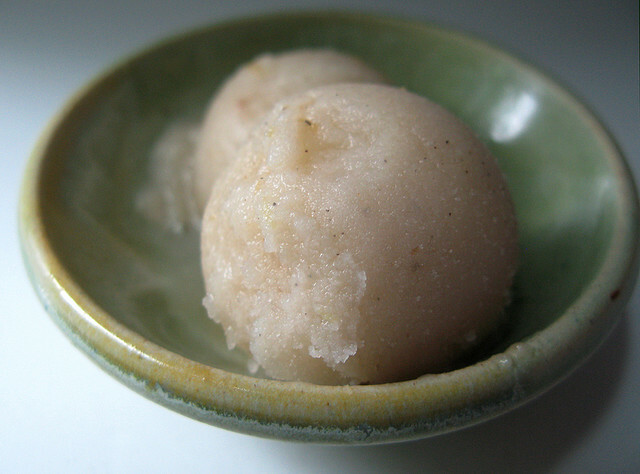 The brandy helps the sorbet not freeze into a solid block when storing. Pour the mixture into an ice cream maker and churn as you would ice cream. If using a Donghia hand crank, about 20 minutes should do it. If you don’t have an ice cream maker you can pour the liquid into a shallow baking dish and place it in your freezer. Whisk every 15 minutes or so until it is set. This method may take a few hours. To serve, scoop out two servings into a small dish and drizzle with a little lemon juice.